Murfor EFS product range for thin joint masonry. Can be used in Thin Joint Systems and conventional mortar joints. Available in galvanized finish and stainless steel. Manufactured in a range of sizes to suit the block width. Masonry Reinforcement Product Selector PDF. 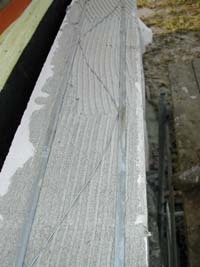 Tackburn can also supply a full range of reinforcement for traditional build applications. Reinforcing Bars for crack stitching repairs can also be supplied. Please call 01527 68559 for a quote.